UNCASVILLE - Brent Buser finished with 23 points and Michael Noyes added 19 points to lead the No. 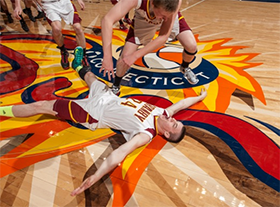 3 seeded Granby boys' basketball team to its first Class S state championship Saturday 83-81 over Weaver in double overtime at the Mohegan Sun Arena. 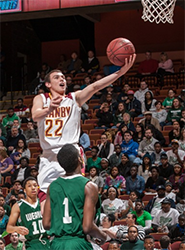 Buser, who transferred in from Queens, N.Y. in the off-season, hit the tying 3-point shot with 3.4 seconds left to send the game into overtime for Granby (23-4). "I was trying to get up the court as fast as possible and take a good three to tie the game," Buser said. "It worked out. After I shot it, it felt good. I thought they were going to foul so we wouldn't get off a three." "They actually brought the ball where we wanted them to, right in the double-spot and the kid never stepped out of bounds on the sideline," Weaver coach Charlie Silvan said. "He split the double-team and went right up for the three." Buser also made a big steal and was fouled with 16.2 seconds left in overtime. He made the first free throw to put the Bears up 83-81. Chris Burt, who led Weaver with 23 points, had the ball bounce off his foot and go out of bounds for Weaver with 3.4 seconds left in the double overtime. "I was just trying to get the steal so we could win that game. I tipped it, grabbed it, and just held onto it for dear life," Buser said. "The spirit and the fight in that third and fourth quarter, was just, I'm not surprised, it was just tremendous," Granby coach Walter Hansen said. "I think the second half, we kept our composure." No. 25 seed Weaver (12-13) led by as many as 21 (40-19) early in the third quarter and by 20 (51-31) with 2:57 left in the third quarter. "It's rough to lose a 21-point lead," Silvan said. "That youth and inpexperience finally caught up to us in a big shot." Then Michael Noyes hit back-to-back 3-pointers for Granby to start the miraculous comeback. Noyes finished with 19 points and Tanner Gibson added 17 for the Bears. Points in the paint-WEAVER 40,GRANBY 24. Points off turnovers-WEAVER 36,GRANBY 23. 2nd chance points-WEAVER 20,GRANBY 5. Fast break points-WEAVER 16,GRANBY 2. Bench points-WEAVER 12,GRANBY 5. Score tied-5 times. Lead changed-7 times. Last FG-WEAVER OT2-01:25, GRANBY OT2-02:55. Largest lead-WEAVER by 21 3rd-07:49, GRANBY by 4 OT-02:50. Technical fouls: Weaver-None. Granby Memorial-None. Lead changed - 5 times.